This weekend I was talking with Jim, and each of us was lamenting the lack of good statistics on this site. We wanted to know how many games are played and which games get played more and how many unique users there are per day, etc. Jim pointed out rrdtool and I decided to set it up and see what kind of data I could get. We thought the end results were pretty interesting and thought they might be of interest to the Greenfelt users. The data is stacked up so that the total height of each bar is the total number of games per hour. The bar is then divided so you can see which games make up what percentage of that bar. Each bar represents 15 minutes. The graph is updated every 15 minutes so if you check back here later it will always be up to date. Not so surprisingly, Freecell looks like the most popular game. Somewhat surprising to me is that Forty Thieves seems to have a lot of plays. Spider, which is really hard also manages to have a respectable number of games played. This is interesting because it shows that huge difference between days and nights. Also you can see that more people play at night in the middle of the week than on weekends (what you have better things to do?? :-)). And Wednesday seems to be the peak. Right now you can also see a huge gap in the Sunday before last when hosting provider (Dreamhost) went down for a couple hours (since this is also updated every 15 minutes that will eventually go away). 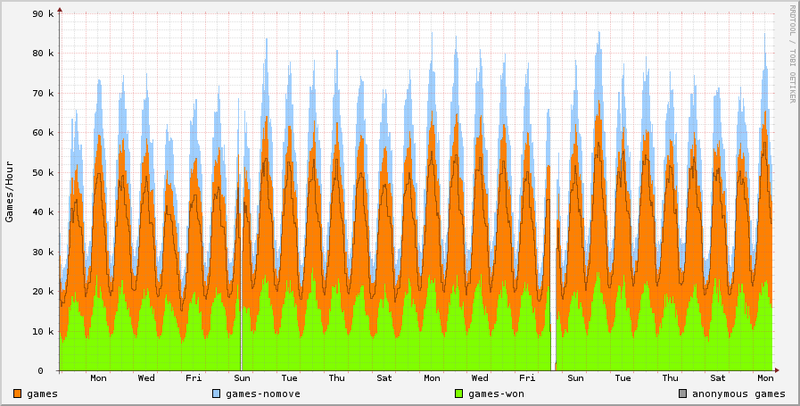 This show total number of games in orange. The green show how many of those games people actually won (getting a score of 52 in Freecell, for instance). 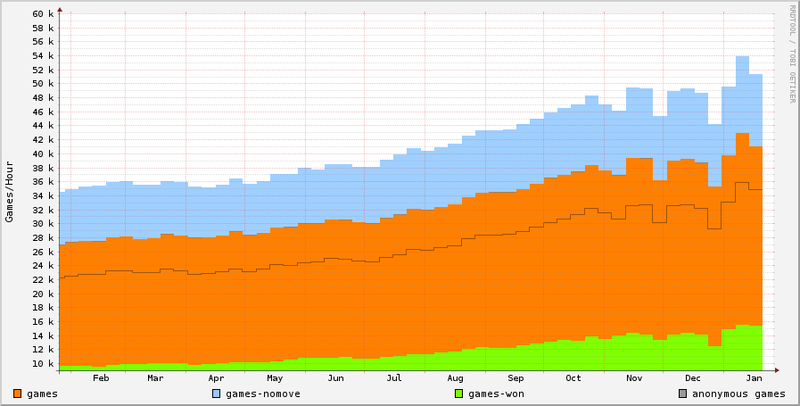 The black line show how many of those games were played by anonymous users. This one had 3 surprises for me. The first was that our overall growth curve is pretty good. 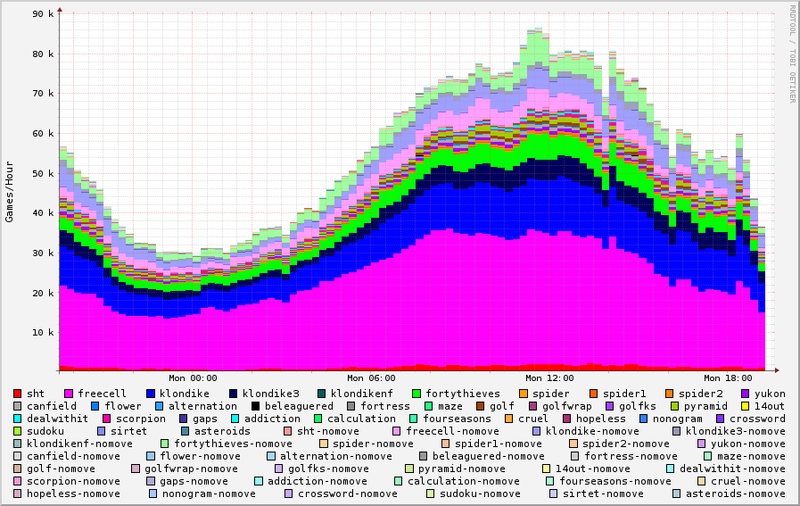 Some spikes here and there but it seems to be increasing nicely. The second was that a really good portion of games are winnable. I expected the green bars to be much lower. The third surprise is that apparently 90% or so of people playing Green Felt play without logging in. I expected a large amount of anonymous users, but such a high percentage really surprises me. Anonymous users, I’m curious–why do you prefer to be anonymous? Does the high score table not interest you? What kind of incentive would it take to make you decided to create an account?